Birth control is one thing that has a significant importance in the life of every woman. For this reason, there have been numerous scammers trying to rip off these women by selling fake birth control options. The majority of these scammers exist online. This has been a major reason as to why the majority of women are distrusting the online sellers who promise to deliver birth control solutions. Yes, there is a very high percentage of scammers commercializing fake solutions. But there are sellers who deliver real solutions. One of them is Prjkt Ruby. 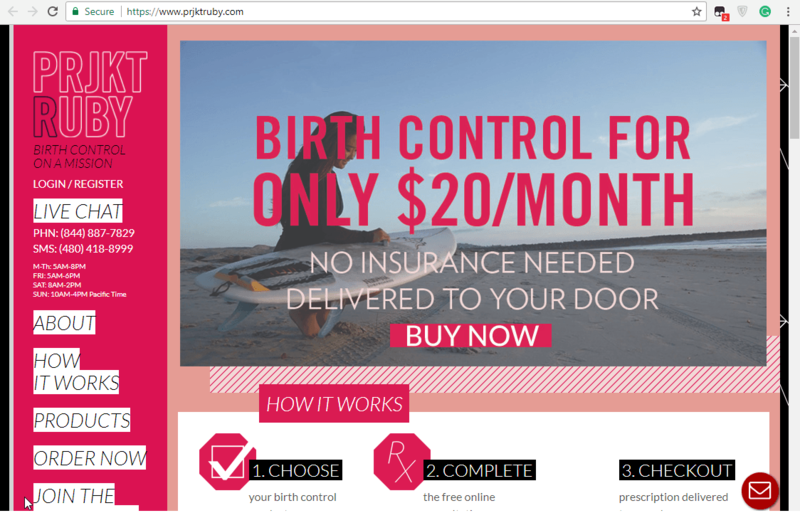 Prjkt Ruby delivers birth control at only a price of $20 each month. This is advantageous to women who don’t have an insurance. Prjkt Ruby claims that the process of taking birth control can be easy, buying these pills can be difficult. For this reason, they offer to help women get access to the pills quite easily. The birth control pills that they sell usually don’t require any prescriptions. This makes it even easier for women to acquire the pills. But, is Prjkt Ruby legal? In order to determine whether what Prjkt Ruby offered was legal and whether it worked, we searched online to see what women who had used it had to say about it. The following is what we came up with. 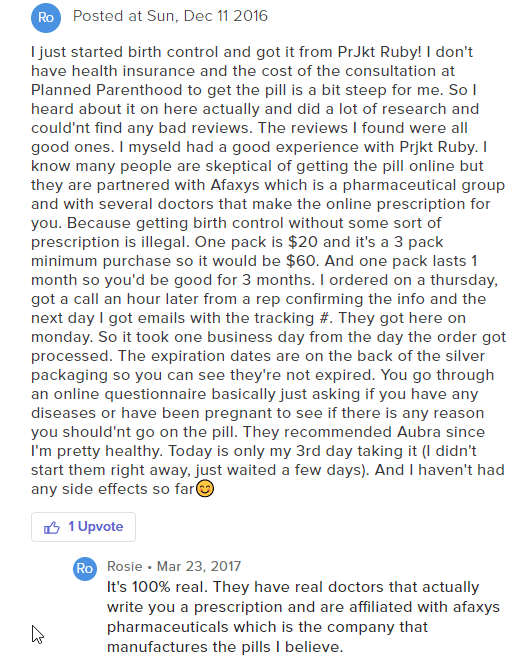 The first person says that she just started on birth control and she got it from Prjkt Ruby. She did not have any insurance and consultation at Planned Parenthood seemed to be way out of her price range. She had heard of Prjkt Ruby. After digging a little to find its reviews, she was satisfied after finding positive reviews. She says that she has had a great experience with Prjkt Ruby. According to her, Prjkt Ruby partners with Afaxys which is a pharmaceutical group. They also partner with doctors who create the online prescription for patients. This makes the whole practice very legal because getting birth control pills would be illegal without a prescription. She had to pay $60 for a 3 month supply. She was able to get her pills after one business day. As she wrote the review, she says that it is her third day taking the pills and she has not had any side effects. A reply from Rossie says that Prjkt Ruby is 100% real. They have real doctors that actually write a prescription and they are affiliated with Afaxys Pharmaceuticals which is the company that manufactures the pills that she believes. The above Prjkt Ruby users say that it is very legal. They use real doctors who offer a prescription and they are also affiliated with a pharmaceutical company that manufactures the birth control pills. This shows that they operate under the confines of the law. The first user wanted to know whether anyone had ever tried Prjkt Ruby before. She says that she had switched jobs and she did not qualify for insurance just yet. Her prescription had just run out. The replier says that she is on her second order. She orders a 3 months supply at a time with Prjkt Ruby. She says that they have fast shipping, an easy to navigate website and friendly customer service people. She says that she is very impressed with her experiences so far. The above Redditor says that Prjkt Ruby is great. She has been getting her birth control from them for a year and a half now and she does not have any complaints. She says that Prjkt Ruby offers users the chance to adjust how often the pills should be delivered which is something that she loves. She gets three packs every 80 days. The customer service is great. She once called them to find out more about her package that had been marked as delivered but she had not received it. She was able to receive a new package without any issues. She says that she would recommend Prjkt Ruby. These Redditors seem very happy with what they get from Prjkt Ruby. This further proves that the company offers great services. This is a company that has the potential for being trusted. We were able to find a number of coupon codes that can be used on Prjkt Ruby in order to save even more money. The first coupon code was available on Prjkt Ruby official website. The above coupon offers the customer a chance to save $5 on every order they make. It also offers the buyers a chance to get free shipping on all their orders. We were able to locate other coupon codes for Prjkt Ruby on third party websites. The first code available above offered any buyer a chance to save 10% on any order they make. The second coupon code allowed the user to save 10% when she orders more than $20 worth of birth control pills. Prjkt Ruby is a company that offers women access to birth control medications without the need to acquire a prescription first. They offer these women access to the meds for only $20 a month. This is beneficial especially to women who don’t have an insurance cover. According to the evidence we have looked at in this article, it is very clear that the company is doing a great job without trying to trick women like scammers usually do. We always offer a chance to our readers to get access to their medications at cheaper prices and at the same time get genuine drugs. This we do by offering the selection of the best drug stores available on the web. These are on our top-rated list which you get access to for free.